The red & trout have been on Fire on our Boca Grande Fishing Charters! Our Boca Grande & Palm Island fishing charters have been on fire. Redfish, trout and the occasional flounder or pompano are being caught in great numbers. Between the frequent cold fronts that come through this time of year, the fish have been chewing on any bait you throw at them. Whether you want to catch a trophy that you will never forget or just have a great time with family & friends, rest assured that Gator Flatts Charters will give you the ultimate backwater fishing adventure! 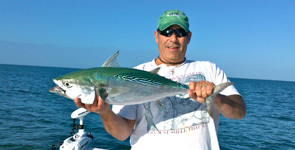 Captian Hutch will bring you the ultimate in fishing & fun while you are on your Boca Grande fishing charter! Boca Grande Tarpon fishing is just a few months away. Be sure to plan your trip of a lifetime soon. Plenty of dates are still available but they are filling up fast. Be sure to plan early to get the dates that you want. Trout are the fish of choice on charters during the colder & shallower winter months. Just like every January & February, big trout can be found with regularity all around the region. Cooler air & water temperatures combined with super shallow tides have pushed the trout into their winter patterns. While targeting the sand holes surrounded by shallow flats, 40-50 trout per trip have been common on our boca grande charters which makes getting the limit for a great dinner quick and easy. Whether you are a novice beginner are a seasoned veteran, non-stop trout action is sure to make your trip FUN for all! These same weather & tide conditions have changed the redfishing as well. Tailing reds can be found throughout the region on the shallow grass flats rooting around in the grass for various crustaceans to eat. These reds can easily be seen and targeting for light tackle fun. Small schools of reds can still be found and targeted as well as they look for food & warmth in numbers. 10- 20 redfish days are common this time year and provide intense rod bending FUN! Redfish are also some of the best fish to eat in the boca grande area and provide planty of food for the whole family! The nearshore bite this time of year on our palm island fishing charters & boca grande fishing charters is also non-stop action. A variety of species can be caught including grouper, various snapper species, mackeral, kingfish, cobia, flounder, tripletail & the occasional goliath grouper. These trips are great for the family and provide plenty of great table fare. Gator Flatts is a boca grande fishing charters and palm island fishing charters service. Pick-ups can be made from several locations including Placida Park, Boca Grande guide docks, Palm Island guide docks & Pine Island marina. Other accomodations can be made at your request. It is our goal to make the entire fishing experience for you as easy as possible! Providing the Fishing Adventure of a Lifetime!